We have a range of energy saving blinds available from roller blinds and vertical blinds to duette, pleated and skylight blinds. Our energy saving window blinds can save you money because they provide insulation that helps reduce both heat build up in summer and heat loss through winter. 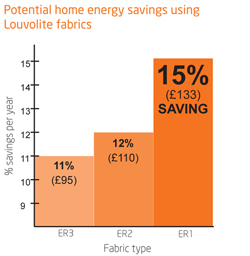 Each of our Louvolite fabrics has been tested and given an energy saving classification of ER1, ER2, or ER3 to give an indication of the cost savings that can be achieved. ER1: High level of insulation and energy savings of up to 15% per year* can be achieved wth these fabrics. ER2: These fabrics provide a good level of insulation and energy savings of up to 12% per year* can be achieved with these fabrics. ER3: These are the essential fabrics for window furnishings and energy savings of up to 11% per year* can be achieved with these fabrics. In addition to saving money every year, the use of blinds with these fabrics will reduce the carbon footprint of your home.